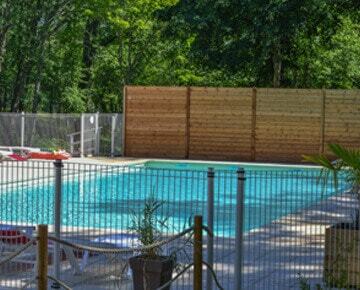 The very favourable climate of the Dordogne Périgord will allow you to enjoy the swimming pool from mid-June to mid-September. The swimming area aquatic complex is exposed to the sun from morning to night and open every day from 9:30am to 9:00pm. You can swim in the heated pool as well as take advantage of the massaging jets to relax. You can also enjoy the sunny weather on one of the many deck chairs on the sun deck or take a nap under the umbrellas. You will also be able to order refreshing drinks and ice cream at the kiosque located beside the swimming pool. Some tables and chairs are at your disposal on the wooden deck. The little ones will be able to have lots of fun, swim, splash and frolic in the shallower part of the pool or play water games. During high season, some water wolo tournaments are organized weekly for everyone to participate. The region of Dordogne-Périgord has a large number of public and private ponds. The St Estèphe and Nouailles ponds are the most famous around here and only a few kilometres away from the campsite. St Estèphe, is ranked as one of the largest and nicest of Dordogne and will welcome you all summer long for swimming, nautical sports, fishing or hiking. There is a little river called the Nizonne which flows very close to the campsite. It is located in a Natura 2000 protected area and has a nice path to walk along on hot summer days. It is also a great place to take your dog for a stroll and maybe a nice refreshing bath. There are a few beaches for swimming in rivers : the Dronne located in Brantôme and some in Creyssac near Bourdeilles and in Lisle. There are 1st and 2nd category rivers nearby for fishing : the Lizonne, Bandiat, Boulou and Dronne to name a few.